Slowly etched over the years by the constant action of the waves, Turnip Rock and other geological formations stand like natural flower pots around the shores of North America’s Great Lakes. From their tops high above the water line, trees form tiny forests, created by seeds drifting on the wind. These miniature worlds high atop rocky crags harbour undisturbed microhabitats – as if nature itself was tending perfect little bonsai gardens in the sky. Formed by the retreat of huge, continent-wide glaciers which towered up to two miles high, the five Great Lakes (Superior, Michigan, Huron, Erie and Ontario) are relatively young in geological terms. First, massive advancing glaciers gouged out deep crevices in the Earth’s surface starting about 85,000 years ago. Then, about 20,000 years ago, as the climate warmed, the ice began retreating. Meltwater filled the lakes and forged rivers which run east to the ocean, providing the continent’s native inhabitants and European settlers with a marine superhighway running into the heart of North America. 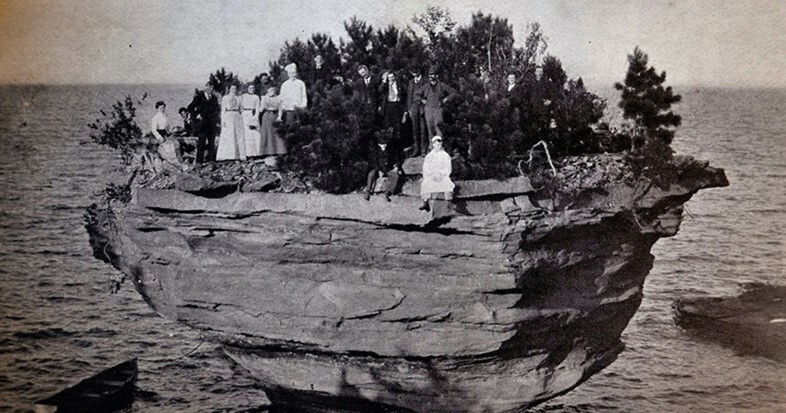 Turnip Rock and other formations like those found on Flowerpot Island in Canada are known in geological circles as ‘stacks’ – isolated outcrops leftover as erosion wears away at the nearby headland. These spectacular towers normally form where horizontally-bedded sedimentary or volcanic rocks are found, particularly on limestone cliffs. Sometimes, the waves will carve out a cave and eventually produce an arch. When this collapses, the isolated stack is left behind. In other cases, the waves wash in and around a stack, wearing away at its base to create precarious-looking overhangs like Turnip Rock. Without the salty sea spray found around ocean stacks, lakeside stacks are more friendly to trees and other vegetation – and can spout impressive displays of pine trees, shrubs and grasses. Birds and other settlers find isolated and undisturbed nesting sites on these inaccessible outposts, making preservation important. While tourists and locals once clambered up and over places like Turnip Rock, most are now preserved and protected to keep these precious natural wonders safe. 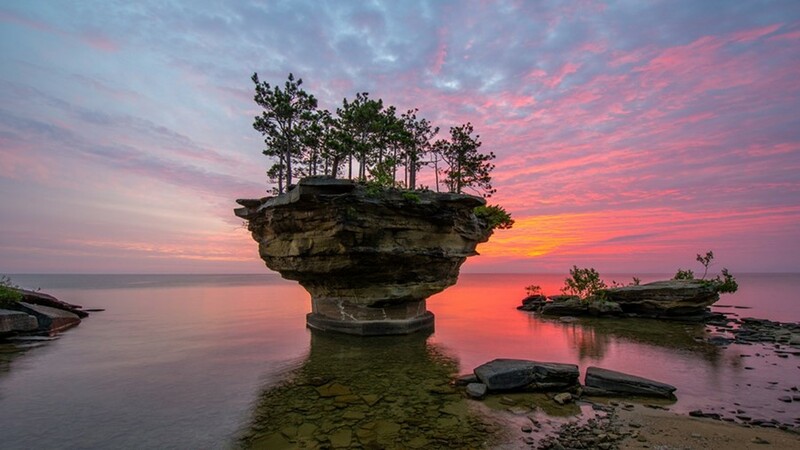 Turnip Rock is privately-owned and closed to visitors – but you can experience it close-up from the water in a kayak, which can be rented in nearby Port Austin. The nearest big city is Detroit. On the Canadian side, Flowerpot Island forms part of the spectacular Fathom Five National Marine Park, accessible from the town of Tobermory, north of Toronto. For more, visit here.